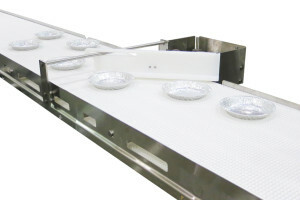 This conveyor is designed as a continuous product spreader, engineered to separate pies. As the pies move down the conveyor they are continuously spread out by an arm moving back and forth. The pies need to be separated to provide increased product cooling and quality. The device is able to accommodate three sizes of pie and a variety of product rates for maximum flexibility. This AquaPruf 7400 Series Conveyor is designed for high-pressure wash-down and easy sanitation. Learn more about Sanitary Conveyors.